With thanks to English Heritage in allowing use of the wording and the image of Boxgrove Priory Ruins. Linking the past with the present. The ruins are often used as a backdrop for photographs for weddings and other parties. The Benedictine Priory of St Mary the Virgin and St Blaise was founded c.1117 by Robert de la Haye, Lord of Halnaker, as a cell of the abbey at Lessay, Normandy, in France. 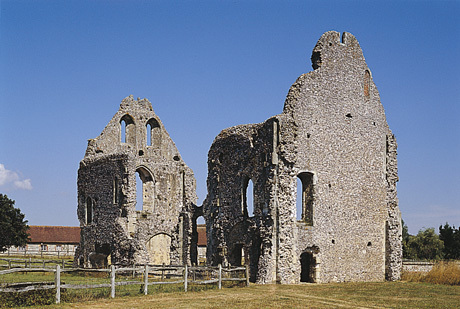 When founded the Priory had a community of only three monks. The number of monks was increased in 1149 but the priory remained part of the French abbey. Boxgrove became independent from Lessay Abbey In 1339, when Edward III seized other foreign monastic properties. Following the Dissolution of the Monasteries by Henry VIII the buildings and land were granted to Sir Thomas West, Baron de la Warr. A model of the original monastic buildings is on display in the church. From this it is possible to see that the western part of the monastic church was demolished in the 18th century and the remains of this can be seen outside. The central tower, chancel, transepts and eastern bay of the nave survive as the present-day parish church. Only one wall of the chapter house survives and can be seen outside the north transept of the church. This has a central doorway with a window either side. No other monastic buildings survive above ground but would have been to the north of the church.